This noteworthy and informative book traces the over 200-year history and development of Islamic-inspired architecture in America from the earliest Spanish-Moorish buildings constructed in the 1700s to the more contemporary buildings of the 21st century. Through its well-written and revealing text and illustrations, the book introduces readers to the influences and evolution of Islamic-inspired architecture in America. The book includes an extensive full color photographic portfolio of more than 100 buildings arranged in chronological order, each accompanied by text describing the building and its history. Many of the buildings depicted were designed by some of America’s most famous national and regional architects, including Leopold Eidlitz, Samuel Sloan, Richard Morris Hunt, Eugene Greenleaf, Cyrus Eidlitz, Louis Sullivan, James Francis Dunn, Bertram Goodhue, Arthur and Nina Zwebell, Timothy Pflueger, Frank Lloyd Wright, brothers Carl and Robert Boller, Minoru Yamasaki and Philip Johnson and Burgee. The author has spent over four years traveling across the country visiting and photographing each of the carefully selected buildings and chronicling their fascinating stories. 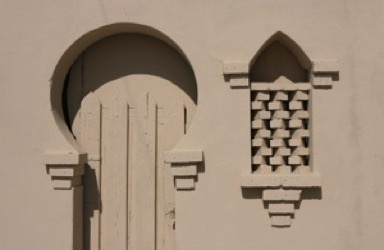 The book examines buildings that have influenced and impacted the American cityscape and includes examples of private villas, homes, commercial buildings, atmospheric movie theaters, Shrine temples, churches, synagogues and family tombs, each of which, in its own way, has contributed to creating this rich and exotic American “Orientalist” style of architecture. 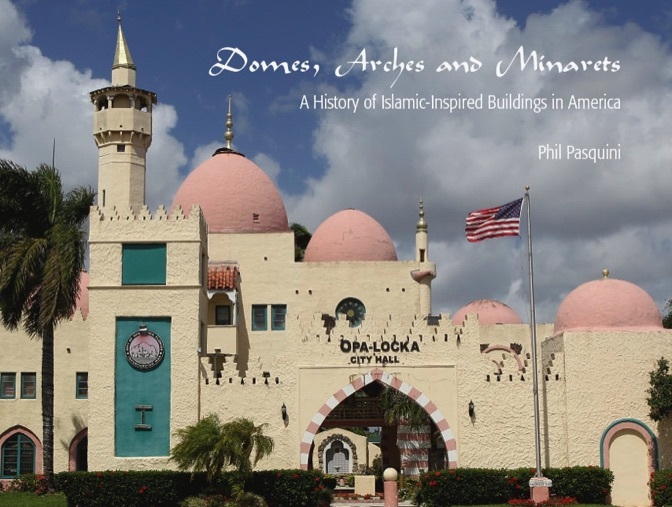 Domes, Arches and Minarets presents for the first time a compelling and concise review of this little-known and underappreciated area of American architectural history. Phil Pasquini is an award winning photojournalist, artist and educator who has traveled extensively across the U.S., Europe, the Middle East and North Africa for more than four decades. His insights and observations of the subject, along with his excellent photographs, make this book a must for anyone interested in Islamic studies, architecture, history and Americana. Besides being a good read, the book is an entertaining and informative treatise on a subject that, heretofore, has unfortunately enjoyed too little exposure and is generally unknown to the American public.